Join us at one of the industry’s most exciting awards evening and get recognized in front of industry stakeholders for your contribution. 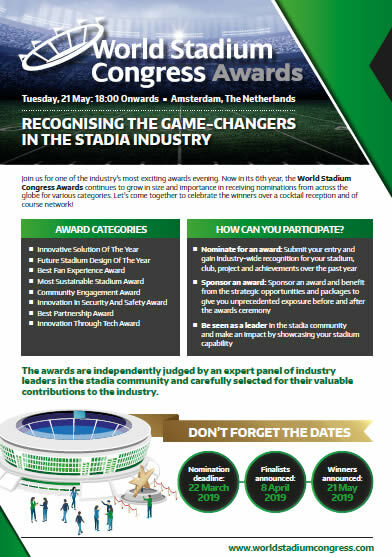 Now in its 6th year, the World Stadium Congress Awards, taking place 21 May 2019 from 6:00pm onwards continues to grow in size and importance in receiving nominations from across the globe for various categories. Let’s come together to celebrate the winners over a cocktail reception and of course network! For more information, call us at +971 4 364 2975 or email enquiry@iqpc.ae.